While cycling along the Leigh Branch of the Leeds & Liverpool Canal recently to check my map data I encountered new signs, intended for cyclists. This was the first sign I found, at Leigh. I was intrigued by the precision of the timings shown on the signs, with Wigan shown as 59 minutes rather than 60 minutes, or 1 hour. 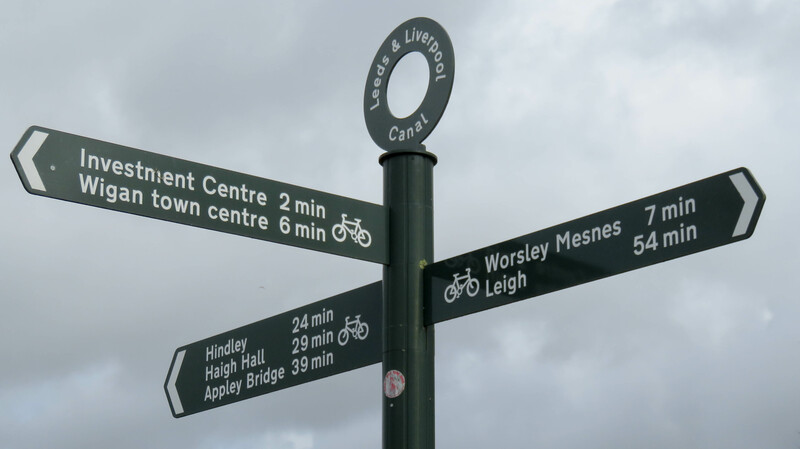 As it takes 10-15 minutes to cycle across Wigan this must be to a very precise location, but where? Later I found this sign at Wigan, at the junction between the Leigh Branch and the main line of the Leeds & Liverpool Canal. Leigh is 54 minutes and Wigan town centre is 6 minutes, a total of 60 minutes cycling, so where did the 59 minutes come from, was it to one end of the pier? This entry was posted in Leigh Branch, Leigh Branch (L&L Canal) by Paul. Bookmark the permalink. 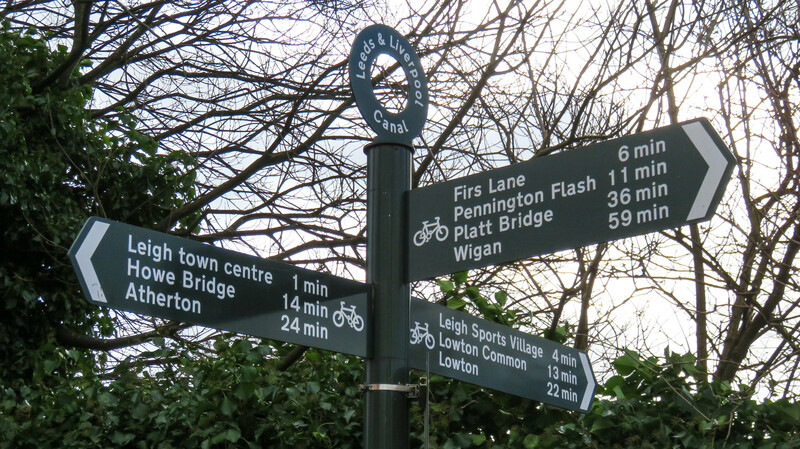 Ah, but really it’s only 5 minutes 38 seconds to Wigan town centre, and 53 minutes 49 seconds to Leigh, but the signmakers were worried that might seem too precise. Given the huge range of speeds at which people cycle (a bigger range proportionately than for walking, I tentatively suggest) then are these times really more helpful than distances? I’d rather know it was 11.2km to Leigh than that for a Standard North West Cyclist it is 54 minutes.